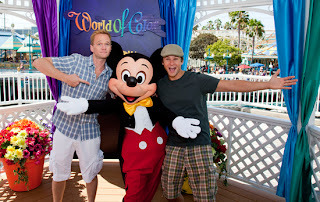 NPH is one of us! He's a big fan of theme parks. Now that Season 5 of Coaster Radio.com is here, we're ready to mix it up a bit. We've made some good changes to our website and blog. Now it's time to make a change on our podcast too! For Season 5, we're unveiling "The Neil Patrick Harris Project!" He also happens to be a big fan of theme parks! Living out in California, he's a regular visitor to Disneyland and Knott's Berry Farm. He often posts about the parks on his Twitter feed (@ActuallyNPH) and has even hosted events for Disney. So, our goal with "The NPH Project" is to make him aware of of our show and to convince him that he should record the opening voiceover for our podcast. It's that simple. Even though we spent Season 4 with another celebrity, NPH is the right choice for this show and project. So, keep watching the blog and listening to the podcast and we dream up ways to catch Neil's attention. We'll need your help! First Courtney dumps him and now Coaster Radio does too. I think a suicide watch is needed for David Arquette...right after I grab him in my dead pool. I'm using the fact that my cat is named "Vinnie Delpino" to attract NPH's attention. Stacey, your cat needs to be the official mascot of "The NPH Project!" I think Vinnie would do a great job! He's the most photogenic cat... uh... EVER!